Come get your life saver by finding the right one for you! We have listed out the Top 5 Best Automatic Closing Toilet Seats that is one solution for all your toilet seat problems. We all have someone in our family who has an annoying habit of forgetting the toilet seat up,with the help of this Automatic Closing Toilet Seats you don’t have to worry about forgetting the toilet seat up. Automatic closing toilet seats is a right choice for elders or senior citizen who has back problem , with this you don’t have to bend over to lift seat .This is a must product to all the hygienic people out there especially Mothers who consider hygiene as top most priority when it comes to their kids and family . Keeping the seat open has chances of kids drinking toilet water, touching the seat and also dropping their face inside. Automatic closing toilet seat quickly solve this issue and you don’t have to touch the toilet seat to lower or raise it, the cover stays closed when not in use! Its100% touch-free technology helps virtually in eliminating the spread of germs. Your bathroom needs upgrade? 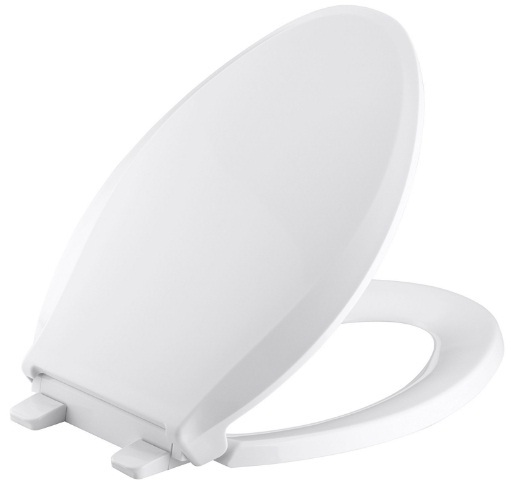 This automatic toilet seat can be installed in a wide variety of bathroom sizes and shapes. For people with disabilities, it has occupancy sensor that can be adjusted that allows the unit to be installed easily. Toilets seat needs to be kept clean as there is risk of spreading germs , so it has designed smartly that can be easily slid off for cleaning . And people who worry about installation, the product can be installed by yourself that takes only few minutes. Now, let’s quickly jump into each automatic toilet seat description with its pros and cons. The Lagute Touch-Free Sensor Controlled Automatic Toilet Seat is perfect for someone with disabilities, senior citizens and families with children. It works super easy, as you approach the seat; the front sensor senses your existence and raises the lid automatically. You can also raise the seat as well by simply holding your hand over the top sensor. Once you walk away, it takes 15 seconds to lower both the lid and seat automatically. The Seat uses a rechargeable lithium-ion battery lasts up to 3 months. The package includes European charger that does not work with American power, however you can use customer support service to provide you with American charger. The closing function may not work if you place any objects over the seat top. The Flush Down toilet seat is a great option for people who worry about their kids and pets from drinking the toilet water. 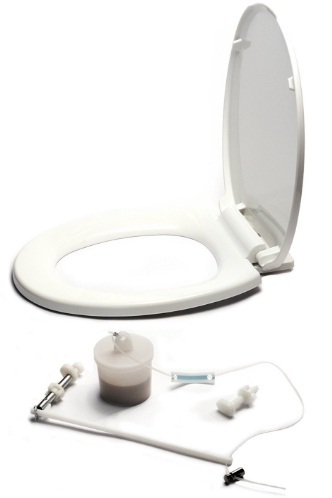 This toilet seat and closing device is designed remarkably to fit all standard toilets with water tanks. It closes the seat and lid automatically when you flush the toilet. It is made up of high-quality durable solid plastic seat with stain resistant. The installation process is easy as it doesn’t require any tools to install and is virtually invisible. The package includes user manual with clear photo guide instructions. The seat gets displaced when a larger person sits on it. A few customers complains about the cord aimed to open/close the seat is not well designed. 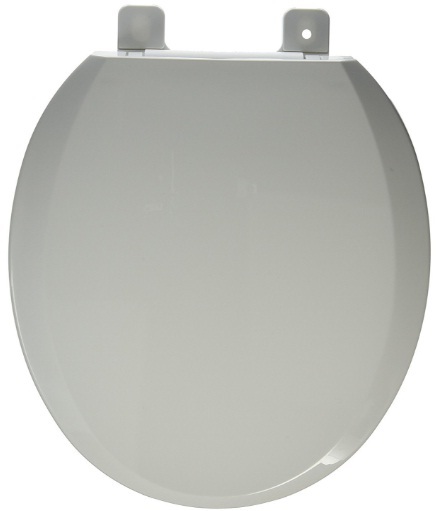 The Kohler Quiet Close automatic toilet seat is best known for its sleek looking design, functional and affordable. You just have to give the toilet seat a light touch and it closes quietly. It also decreases germ transfer. The product is available in a varied range of colors that includes black, grey, white, biscuit, almond, cashmere, and more. It is relatively easy to install and clean. The bumpers grip strongly to hold the seat in a place firmly, so that it won’t displace too much even for heavier users. A few users is not happy with its shape they find it inconvenient to use. Some customers say that the bolts used to fix the seat are not sturdy enough. 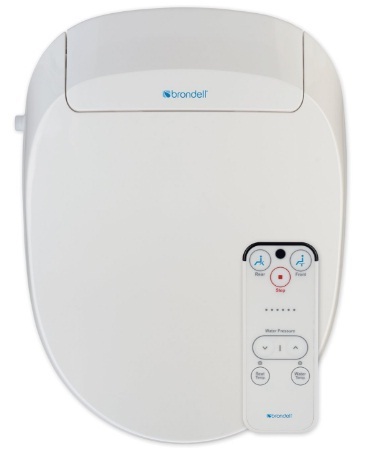 The Brondell Swash automatic-closing toilet seat and bidet is very innovative option. This renewed model has advanced function of bidet cleansing which will be more surprising and more hygienic for people who are used to toilet paper hygiene. According to many users, washing with water is said to be more effective and refreshing way to clean. However, it is considered as little expensive one when compared with other automatic toilet seat. 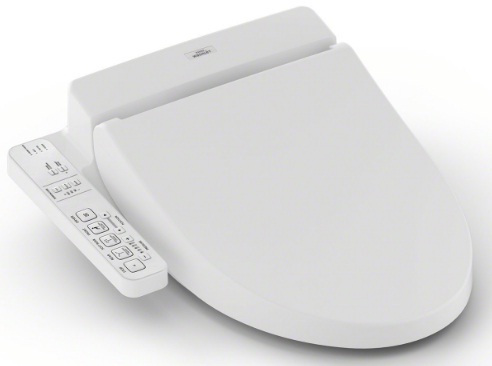 What make the product unique are its addition features that includes an automatic toilet closer, a heated seat, a bidet, and a wireless controller, this bidet design seat is a good option to consider. Some users find the bidet design less likely. The opening of the toilet seat is too small that makes it uncomfortable for larger individuals. TOTO automatic toilet includes a bidet feature that has a soft-closing lid and a wireless controller. It’s just not an automatic toilet seat closer; it is a bidet as well. Many users say that once they start using bidets they will completely give up on toilet papers. However, it is a bit expensive than rest other options – but when we talk about its advanced option that has quality features than this is great choice to consider and also it has received the best feedbacks from its user . You may require a professional to install it. Some users find it a bit large than what they expected. Vent blower considered a little noisy and can stay on a little too long. In this, Top 5 Best Automatic Closing Toilet Seats reviews and buyer’s guide; we have looked at different toilets seats with the aim of finding the best one .While it wasn’t easy to find out the best one , we still tried our best to collect all the best automatic closing toilet seat . We have collected on the basis of quality, design, effectiveness, durability and advanced technology. All the above products ranks top and will solve all your issues especially bending over to raise and close the seat. The automatic toilet seat is manufactured in a simple and user-friendly design that makes controlling easy.